The government’s much-hyped Direct Benefit Transfer programme has hit a roadblock. Banks have failed to meet the huge demand for opening accounts for welfare cash transfer. This threatens to derail the welfare delivery programme and the country’s mega plan of financial inclusion. Jitendra pores over government files and travels to Madhya Pradesh to analyse the crisis. Barkoti Kalan has still not recovered from the freak hailstorm that wiped out many hectares of standing crop in northern and central India in March. The village is some 55 kilometres from Sagar district in Madhya Pradesh, one of the worst-hit states. People here are witnessing a financial crisis like never before. But instead of hurrying to prepare the next crop, farmers are rushing to open their first bank account. Soon after the natural calamity, the state government announced compensation to those who lost their crop. The amount can be easily transferred to the victims’ bank accounts. The Centre’s much-celebrated Direct Benefit Transfer (DBT) programme promises to electronically transfer welfare amounts, like old age pension, students’ scholarships and even daily wages under the Mahatma Gandhi National Rural Employment Guarantee Scheme (MGNREGS), in people’s bank accounts. But transfer of benefits is easier said than done. Most people in Barkoti Kalan, like in the rest of India, do not have a bank account. 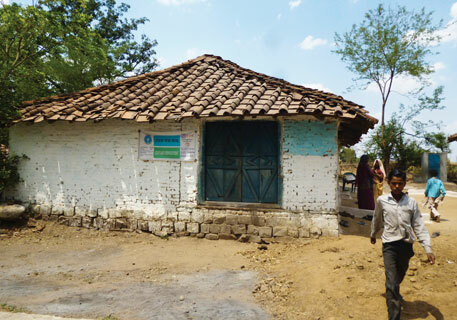 Many villages across the country do not even have a bank. 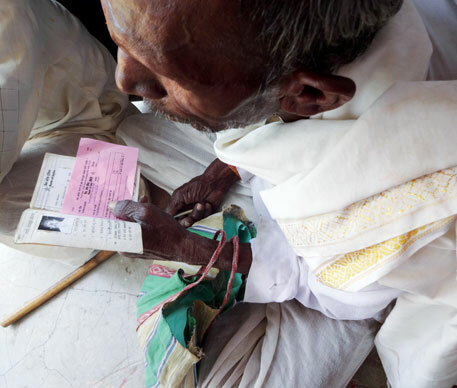 Census 2011 recorded that nearly 500 million people in India are not included in the formal banking system. Of these, 370 million live in rural India. Without bank accounts, the poor, old and the needy will lose the much-needed cash. Way back in 2008, a high level committee headed by C Rangarajan, former governor of the Reserve Bank of India (RIB), recommended a comprehensive plan to include each one in the country in the formal banking system. 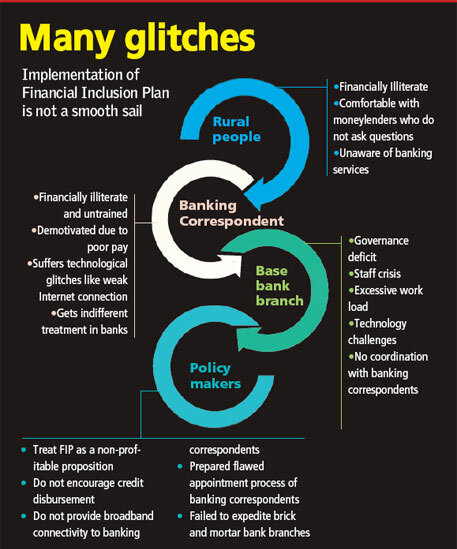 In 2010, the Centre launched the Financial Inclusion Plan (FIP) under RBI’s supervision. Its objective is to make core banking services accessible to the low income and disadvantaged rural population. In the first phase, that ended in March 2013, it aimed at bringing all villages with more than 2,000 people within the formal banking system. In the second phase, that will end in March 2016, villages with less than 2,000 people will be brought under FIP. To simplify the process of opening a bank account, government banks closest to these villages either open a branch, set up a banking kiosk, or place a banking correspondent there. People have the advantage of opening accounts with zero balance. The account makes availing development benefits easy. The sudden hailstorm made the need for banks just more urgent. Barkoti Kalan, however, has been struggling to implement FIP for the past two-and-a-half years. Dharmendra Kumar, banking correspondent for Central Bank of India, came as the messenger of hope. His task is to open accounts of 10,000 people in five panchayats. This means, if he fails to do his job, each of these people may lose government benefits. Dharmendra has a one-room office adjoining a grocery shop, a biometric machine to access thumb impressions and a laptop, a crucial link between people and the bank. Yet, opening an account is a distant dream. Chandrabhushan Dubey, 25, has been meeting Dharmendra for the past three months to get an account opened. “Earlier, he would complain of electricity problem and show the discharged laptop. Since seven days, the Internet connection has been weak. The laptop has an almost perpetual display on its screen saying ‘Reconnecting...’,” says Dubey. Technological glitches have slowed down Dharmendra’s work pace substantially. “In the past seven months, I have not been able to meet the needs of people in my own village. How will I go to the remaining four panchayats under my jurisdiction?” he says. Barkoti Kalan is not alone in its struggle. Purio panchayat in Ranchi’s Ratu block marked the beginning of FIP in Jharkhand. What followed was sudden, high-level bureaucratic activities in the panchayat. Bank and political stalwarts kept making rounds of the village to monitor the programme’s progress. “They said a bank account will curb corruption and ensure that compensation money reaches no one but us,” says Sati Devi, daily wage labourer under MGNREGS. But two years later, her passbook is blank. “I went to the banking correspondent to get my wages, but he said my fingerprints did not match the records. He told me to contact the base branch of Bank of India. I walked 12 km to reach the bank, but got no help from there either,” she says. In Narsinghpur district in Madhya Pradesh, 32-year-old Sandhya Kori is not even aware of FIP. The Dalit woman is a tailor by profession and finds it unsafe to keep her earnings in her thatched house. “When my husband went to open a bank account, they did not entertain him,” she says. Despite DBT, dearth of banks is a problem across the country. As a trend, the poorer the region the more severe the shortage. The inconvenient coincidence is that poor areas are also the regions where maximum beneficiaries live, making a need for banks more acute. The country aims to give an account to every Indian by 2016. But in the past three years, only 100 million accounts were opened. The country is still one of the least banked countries in the world. 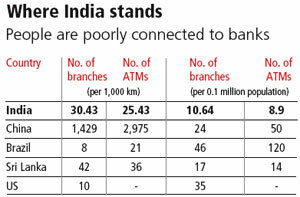 In fact, banking infrastructure in India is one of the worst in the world (see ‘Where India stands’). According to the finance ministry, for every 12,500 people there is just one bank. Currently, there are 28 Centrally-funded schemes under DBT, which covers 4 million people. The government is already faltering in managing this. How will it manage when its four major programmes—Right To Education, MGNREGS, LPG and National Social Assistance Programme—are included which will cover 650 million people? (see ‘Challenge for India’). Most bankers admit they are not ready for FIP. “In Narsinghpur, UCO Bank, Punjab National Bank and Canara Bank have not even started appointing banking correspondents,” says Ashok Kumar Chakrabarty, lead district bank manager. Others, who evaluate the performance of their banks on the basis of profit and volume of business, say opening zero-balance accounts is not a profitable proposition. Maintaining account registers, paying banking correspondents and Internet support companies involves costs. A bank spends Rs 50 for opening one account. It spends another Rs 40 per year for managing accounts, says R L Naik, lead district manager in Sagar, Central Bank of India. Banks do not see its recovery. Further, with a pathetic infrastructure, banks find the huge task of reaching banking services to the last person in the country nearly impossible. When Naik joined the district branch two years ago, it had a staff of only two. “After FIP, the number of clients is growing steadily but the volume of business has not increased. We are unable to manage it with the limited staff,” he says. 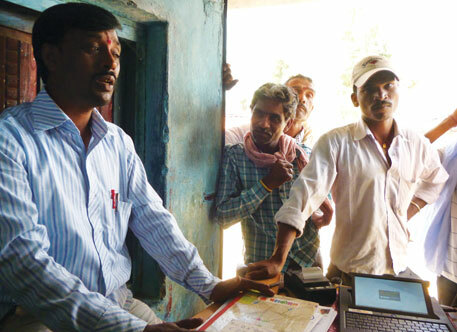 FIP makes it mandatory for base branch managers to visit villages and motivate people to open accounts. “With the limited staff, it is impractical,” he says. Jain Bhushan, general manager of state level banker’s committee, Bank of India, Jharkhand, says the biggest challenge in FIP is maintaining correct data that testifies the identity of a beneficiary. Banking correspondents submit forms and other documents at the base branch. The bank sends data, such as addresses, names, fingerprints and bank account numbers, to the respective district administrations for verification. But problems like mismatch in names and addresses are rampant. Nearly, 70 per cent of the data is wrong, says Bhushan. The problem is compounded because of financial illiteracy among beneficiaries and banking correspondents. Saurav Jain, assistant manager at the rural branch of Central Bank of India in Sagar, says every day at least five people reach the bank for opening their accounts to get relief for crop loss. But most already have their accounts so the bank server refuses to accept their data. The beneficiaries give a series of excuses like having lost their previous passbook in natural calamities. Then there are those who are never satisfied that they have received cash till they get it in their hand, says Jain. They would first get their passbook updated. Then they would withdraw the amount. Happy with the money, they would deposit it back in the bank for safety. It increases work load of banks staffs, he says. “Financial illiteracy also leads to one-sided transactions,” says Charan Singh, Reserve Bank of India chair professor, IIM Bengaluru. “People use their accounts only to withdraw subsidy. They are not motivated enough to do transactions,” he says. Banking correspondents also accept too much of unnecessary documents from people. “Clearing junk data consumes a lot of our time,” says Bhushan. Naik complains that banking correspondents keep making phone calls asking if their accounts have opened or not. “There is already too much workload. How do we ask our potential customers to wait so that we can answer the banking correspondent?” he asks. Twenty-one-year-old K Lavanya has been working for the past four years as a banking correspondent for Andhra Bank in Kanakamamidi village, about 30 km from Hyderabad. She deals with 450 accounts. She starts work at 8 am. Most of the days, her work stretches till 8 in the night. Lavanya works from home with a handy electronic machine given by her employer, Bartronics India Limited, IT service provider. All the account holders have smart cards which are inserted in the machine to access account details and to do transactions. People can credit and debit up to Rs 5,000 with the help of this handy machine. Lavanya also disburses loans up to Rs 25,000 and collects their repayments. About 40 people have recurring deposits in “Lavanya’s Bank”. “I have a 24-hour job. All the customers live closeby. I cannot refuse anyone even if they come in the night,” she says. For her full-time job, Lavanya gets a pittance Rs 500 as monthly salary and 0.5 per cent commission on every transaction. “I can earn only up to Rs 1,500 a month,” she says. Banking correspondents, the backbone of FIP, have got a raw deal in the programme. Durgesh Pharkade, banking correspondent at Manikwada branch of Bank of India in Maharashtra’s Wardha district, says he is paid 0.5 per cent commission on every transaction up to Rs 10,000. “For higher amounts, Rs 25 is all we get per transaction,” he says. A banking correspondent’s income varies from bank to bank, says L M Deshmukh, who works in Bank of Maharashtra and is member secretary of the state-level bankers’ committee, the nodal body for the implementation of FIP. “Commissions vary from 0.15 per cent to 1.80 per cent. Bank of Maharashtra pays fixed monthly remuneration of Rs 2,500,” he says. Dharmendra of Barkoti Kalan, however, has not received anything since he joined seven months back despite being promised Rs 12 for every account he got opened, Rs 15 for Aadhaar seeded account and 2.5 per cent commission for every transaction. Dharmendra was appointed as a banking correspondent by MPCON, IT service provider for Central Bank of India. “We are expected to be in the field from 8 am till 2 pm. After that, bank officials ask us to work at the branch office to prepare loan proposals, and vouchers and to update files. We are not paid anything for this,” says a banking correspondent who did not wish to be named. Deshmukh says that the average commission of 0.4 per cent is not a bad bet for the banking correspondent. But he can earn about Rs 10,000 for 25 days’ work in a month only if his transactions are worth Rs 1 lakh daily. To make this possible, government must hasten the process of transferring remunerative subsidies on fertilisers and kerosene through direct benefit transfer. “The bulk of transactions has to go up sufficiently to make the model sustainable, and soon, before too many correspondents lose faith and quit,” he says. Three years after the Financial Inclusion Plan (FIP) was implemented in the country, the Reserve Bank of India (RIB) prepared the progress report of the first phase of the plan. The report states that the country is showing signs of improvement in including the low income and disadvantaged rural population in the formal banking system. The state-level bankers’ committees of different states, the nodal body for implementation of FIP, also claim similar achievements. Madhya Pradesh claims to have achieved its target of covering all villages with more than 2,000 people. In Maharashtra, against a population of 78 million, the state has 70 million bank accounts, says L M Deshmukh, member secretary of the state-level bankers’ committee. “Andhra Pradesh has successfully completed the task of providing banking services to all the 6,640 villages which have more than 2,000 people,” says M Bala Bhasker of Andhra Bank, chief manager state-level bankers’ committee. Jharkhand also claims having achieved the target. Based on these, the Nachiketa Mor Committee, set up by RIB, stated in its report that the target of universal financial inclusion by January 1, 2016, is achievable. The committee was formed in September 2013 to prepare a roadmap of financial services for small business and low income households. Ground reality and facts belie the claim. 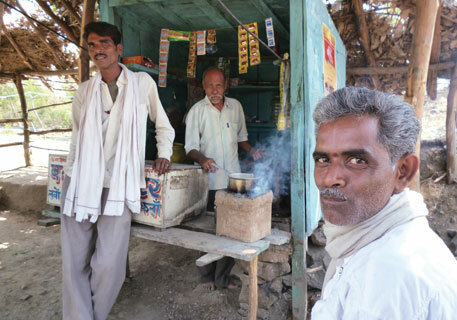 RBI’s annual report states that 119,000 villages have been covered under FIP. According to Census 2011, the country has only 115,000 villages with more than 2,000 people. These villages comprise more than half of the rural population—400 million. As per RBI’s annual report only 100 million accounts have been opened in the first phase. The committee also based its report on the success of Aadhaar card enrolments for direct benefit transfer scheme, says Charan Singh, chair professor RIB at IIM Bangalore. The country has already given Aadhaar numbers to 550 million people. After linking them with their bank accounts, achieving the universal financial inclusion target would not be difficult, the committee assumed. But the mega programme lost its objective after the Supreme Court ordered that it was not mandatory to have an Aadhaar card to avail government benefits, says Singh. “The 2016 target is far too ambitious,” he adds. When the government rolled out DBT in January 2013, there were only 4 million beneficiaries in the first phase. These, too, could not be covered because of the absence of banking infrastructure and technical glitches in preparing biometric Aadhaar card (see ‘Transition Failure’, June 16-30, 2013). Covering 833 million rural people under FIP, no doubt, is a gigantic task. When the government planned FIP, it adopted a technology-driven model. The aim was to reduce cost and curb corruption. But it ignored the fact that technology has its own constraints. Internet connectivity in remote areas is very poor and banking correspondents demand broadband services for seamless service in transferring biometric files. To overcome the crisis, the government launched a programme to provide broadband services to all the 250,000 panchayats in the country. It aimed to complete the task by 2013, but till date nothing has been done. The target has now been extended to 2015. As per RIB rules, each bank branch must organise camps to make people aware of FIP. This has happened, but only on paper. Camps were planned in two blocks of Sagar district in Madhya Pradesh on April 21. It was cancelled at the eleventh hour. “This is the third time that such a programme has been cancelled. On paper, however, it was stated to be a success,” says a bank official on condition of anonymity. To educate people, banks have opened 896 financial literacy centres across the country, but few function. There are serious flaws in the appointment of banking correspondents. Almost 200,000 correspondents were appointed in the first three years of FIP. Banks fix their IT service providers through bidding. The service providers appoint banking correspondents. “This is against the spirit of FIP,” says Navin Kumar of the National Institute of Banking Management, Mumbai. It smacks of irresponsibility and is the prime reason for poor relations between correspondents and banks, he adds. 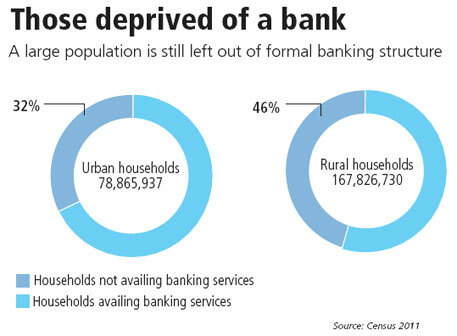 Besides, the schemes that banks offer are more for the urban population than rural folks. “To encourage credit lending, the financial products should suit rural needs,” says Gopal Naik, professor IIM Bengaluru. 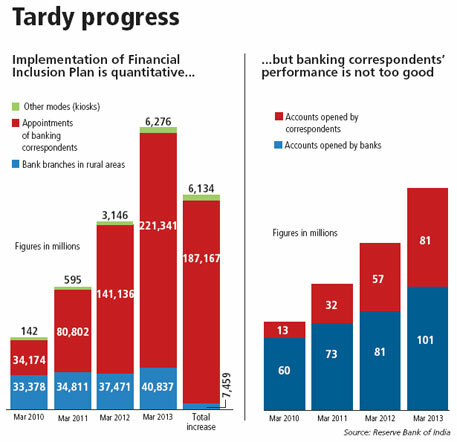 FIP implementation increased bank accounts by 100 million in three years. But the government made no effort to increase bank staff. “Currently, there are only 850,000 staff in government banks. More than 200,000 posts lie vacant,” says C H Venkatachalam, general secretary, All India Bank Employees’ Association. Banks’ approach towards FIP is, therefore, half-hearted. Financial inclusion makes good business sense for banks which have exemplified good governance. 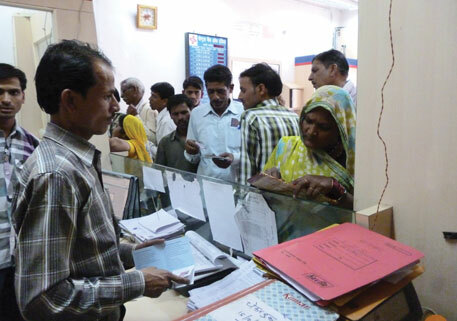 “As many as 146,000 no-frills, or zero-balance, accounts were opened in the Wardha branch of Bank of India in the past two years,” says Mohan Mashankar, lead district manager. It earned them deposits of Rs 13 to Rs 14 crore. The additional business has come as an unexpected windfall. “Once people have access to a bank account, it is a great incentive to save surplus money for future use,” he adds. Banks have started showing interest in lending credits to self-help groups (SHGs). 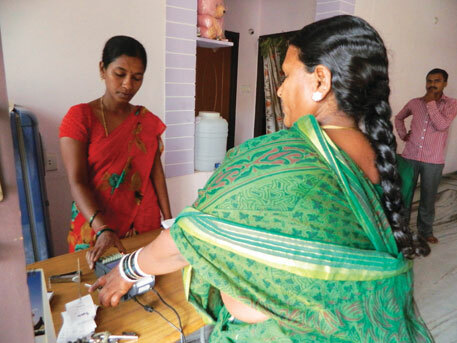 Andhra Pradesh has built a strong link between banks and women’s SHGs. Of the 8 million rural SHGs in India, about 1 million are in Andhra Pradesh. Since 2000, banks have disbursed about Rs 60,000 crore to SHGs as loans. In 2013-14 alone, more than Rs 12,000 crore was given to SHGs. “Of the total loans given by banks to SHGs in the country, at least 50 per cent is in Andhra Pradesh,” says V V Rakhunatha Reddy, director, Society For Elimination of Rural Poverty under the department of rural development. “This was possible because of the strong rapport between government and banks,” says C Doraswami, general manager and convenor of state-level bankers’ committee in Andhra Bank. Basix, a Hyderabad-based non-profit engaged in micro-financing, lends credits to SHGs and other rural entrepreneurs. “We have nearly 99 per cent recovery rate,” says Anoop Kaul, who works in the non-profit, and is former general manager, State Bank of India. This shows that with proper management, rural banking can be a profitable business, he says. “Banks should now focus on forming SHGs comprising low income disadvantaged groups so that they are able to take their services to the rural masses,” says Gopal Naik, professor, IIM Bengaluru. R L Naik, who was then manager of Central Bank of India’s Etawah branch in Uttar Pradesh, says the bank earned more than Rs 15 crore under FIP. “It happened because of proper management and close monitoring of banking correspondents,” he adds. Anil Kumar Kale, branch manager at Bank of India’s branch at Bhidi village in Nagpur district, amid excessive workload, banking correspondents come as a helping hand. “A lot of the regular work that was being done at the branches is now being handled by them through their hand-held biometric machines. A large number of beneficiaries of old-age pensions are being serviced exclusively by banking correspondents,” he says. B C Kulkarni, manager of Deoli branch in Nagpur which covers nine villages, says the branch has opened around 3,000 additional accounts. “Each of these accounts have at least one transaction per month in government’s subsidies,” he says. “However, some of the agricultural loan work, disbursement as well as recovery, is now being handled by banking correspondents at the village-level itself. The end result is that our workload at the branch level has not increased by more than 10-15 per cent,” he adds. To encourage banking correspondents to work sincerely and to curb their high attrition rate, it is essential to give them good incentives, says B A Prabhakar, former chairperson and managing director of Andhra Bank. “They should be given responsibilities like recovery of bad loans and motivating people to do more banking transactions,” he says. “Besides, banks should open centres and appoint officers who can coordinate with the correspondents and review their performance,” he adds. “Since there is so much work pressure, every bank should have a dedicated staff to implement FIP in the right spirit,” says a manager with regional rural bank in Sagar who did not wish to be named. This apart, there is an urgent need to counsel people in rural areas about the benefits of mainstream financial system, he adds. K C Chakrabarty, deputy governor, Reserve Bank of India, says governance deficit is the prime reason for the slow progress of FIP. To make the mega programme work it is imperative to improve management and accountability and make the system transparent, he says. Being in a rural branch of a bank for last few months what I have seen that people rarely use their accounts for saving purposes. For them banks are merely cash points. So whenever the pension or gas subsidy or anything from government is disbursed they will immediately withdraw it. Unlike the city folks they need their passbooks updated daily even if there is no cash. They hardly use ATMs and all these adding a lot of work pressure on the bank staff.